In this part on the Minoans, we’ll explore some details of the Palace at Knossos, and see some of their daily life. 1. A theater spreads on the western side of the palace. The above photograph shows the paved yard and the seats behind it. It might have been used for religious rituals. The small number of seats indicates that the audience was aristocratic. Maybe people from other palaces came here and pledged loyalty to Knossos, which had grown into the largest royal residence. The paved yard suggests that the famous bull jumping rituals didn’t happen here, or in the palace’s courtyard, which was also paved. The stones would have made a bone-crunching surface to land on. 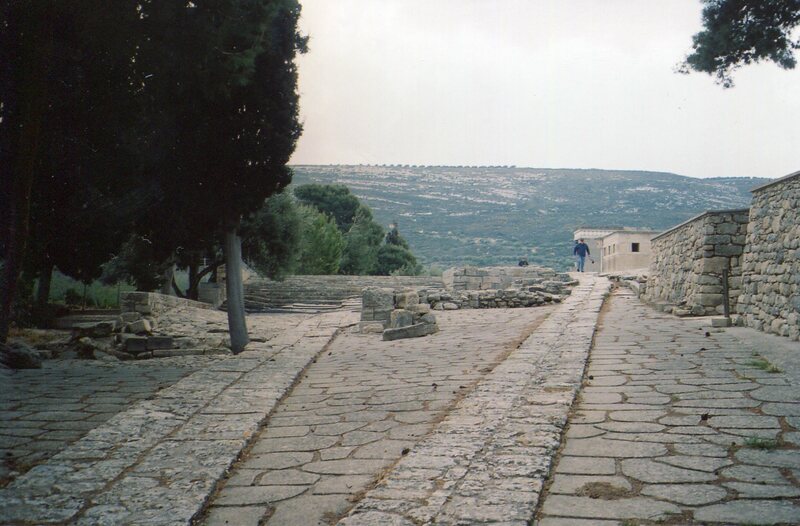 Minoans made many paintings of processions, so maybe they used this place for some of them. The yard is both elegant and intimate. It’s also stately, yet in harmony with the natural surroundings. Minoan art has all these features. The more you hang around this palace, the more beautiful you find it to be. 2. 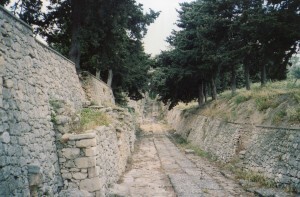 A paved walkway leads towards the palace. As you can see in the picture below, it’s also both elegant and human-scale. 3. The palace measures around 500 x 500 ft, and it rambles around a large rectangular courtyard. It now has remains of about 800 rooms, but it probably had around 1300 back in the day. 4. A throne room presided on the left side of the courtyard. Arthur Evans reconstructed most of it, but the stone throne carved with wavy lines around the edges was found intact. He built the room over it. 5. Abstract carvings of bull horns lined the tops of walls facing the courtyard. The bull jumping rituals suggest that the Minoans revered bulls, perhaps because they embodied nature’s power, fertility and regalness. This strongly masculine symbol complemented the large number of goddess figurines the Minoans fashioned. 6. The 20+ storage rooms were behind the throne room. 7. The right side of the courtyard is centered on a large colonnaded staircase, and the royal apartments. The king and queen had different main sitting rooms. 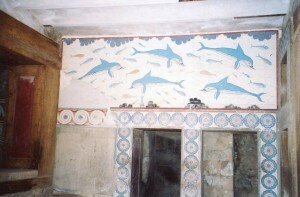 In the queen’s room (shown above), you can see the same love of realism, nature and graceful motion in the dolphins that we saw in their art in Facts and Maybes About the Minoans, Part Two. The wooden entryway on the far left fronted her bathroom. The left doorway took her into a hallway that went directly to the king’s megaron, which was only 20 feet away from hers. Though the king and queen had separate sitting rooms, their living quarters were cozy. So from the outer theater and walkway to the queen’s inner chamber, the Palace at Knossos is both stately and humanistic. 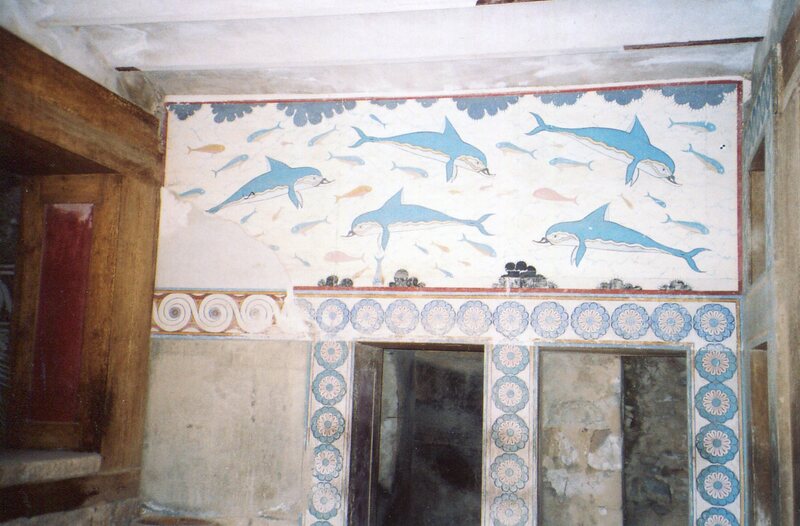 So what happened to the Minoans? In the final post, we’ll see how they ended, and why they made a huge impact on Western cultural history.